Heart rate is the speed of the heartbeat measured by the number of contractions (beats) of the heart per minute (bpm). The heart rate can vary according to the body's physical needs, including the need to absorb oxygen and excrete carbon dioxide. It is usually equal or close to the pulse measured at any peripheral point. Activities that can provoke change include physical exercise, sleep, anxiety, stress, illness, and ingestion of drugs. The American Heart Association states the normal resting adult human heart rate is 60–100 bpm. Tachycardia is a fast heart rate, defined as above 100 bpm at rest. Bradycardia is a slow heart rate, defined as below 60 bpm at rest. During sleep a slow heartbeat with rates around 40–50 bpm is common and is considered normal. When the heart is not beating in a regular pattern, this is referred to as an arrhythmia. Abnormalities of heart rate sometimes indicate disease. While heart rhythm is regulated entirely by the sinoatrial node under normal conditions, heart rate is regulated by sympathetic and parasympathetic input to the sinoatrial node. The accelerans nerve provides sympathetic input to the heart by releasing norepinephrine onto the cells of the sinoatrial node (SA node), and the vagus nerve provides parasympathetic input to the heart by releasing acetylcholine onto sinoatrial node cells. 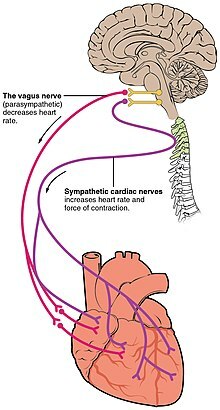 Therefore, stimulation of the accelerans nerve increases heart rate, while stimulation of the vagus nerve decreases it. Due to individuals having a constant blood volume,[dubious – discuss] one of the physiological ways to deliver more oxygen to an organ is to increase heart rate to permit blood to pass by the organ more often. Normal resting heart rates range from 60-100 bpm. Bradycardia is defined as a resting heart rate below 60 bpm. However, heart rates from 50 to 60 bpm are common among healthy people and do not necessarily require special attention. Tachycardia is defined as a resting heart rate above 100 bpm, though persistent rest rates between 80–100 bpm, mainly if they are present during sleep, may be signs of hyperthyroidism or anemia (see below). Parasympathetic stimulation originates from the cardioinhibitory region with impulses traveling via the vagus nerve (cranial nerve X). The vagus nerve sends branches to both the SA and AV nodes, and to portions of both the atria and ventricles. Parasympathetic stimulation releases the neurotransmitter acetylcholine (ACh) at the neuromuscular junction. ACh slows HR by opening chemical- or ligand-gated potassium ion channels to slow the rate of spontaneous depolarization, which extends repolarization and increases the time before the next spontaneous depolarization occurs. Without any nervous stimulation, the SA node would establish a sinus rhythm of approximately 100 bpm. Since resting rates are considerably less than this, it becomes evident that parasympathetic stimulation normally slows HR. This is similar to an individual driving a car with one foot on the brake pedal. To speed up, one need merely remove one’s foot from the brake and let the engine increase speed. In the case of the heart, decreasing parasympathetic stimulation decreases the release of ACh, which allows HR to increase up to approximately 100 bpm. Any increases beyond this rate would require sympathetic stimulation. Using a combination of autorhythmicity and innervation, the cardiovascular center is able to provide relatively precise control over the heart rate, but other factors can impact on this. These include hormones, notably epinephrine, norepinephrine, and thyroid hormones; levels of various ions including calcium, potassium, and sodium; body temperature; hypoxia; and pH balance. The catecholamines, epinephrine and norepinephrine, secreted by the adrenal medulla form one component of the extended fight-or-flight mechanism. The other component is sympathetic stimulation. Epinephrine and norepinephrine have similar effects: binding to the beta-1 adrenergic receptors, and opening sodium and calcium ion chemical- or ligand-gated channels. The rate of depolarization is increased by this additional influx of positively charged ions, so the threshold is reached more quickly and the period of repolarization is shortened. However, massive releases of these hormones coupled with sympathetic stimulation may actually lead to arrhythmias. There is no parasympathetic stimulation to the adrenal medulla. Calcium ion levels have a great impact on heart rate and contractility: increased calcium levels cause an increase in both. High levels of calcium ions result in hypercalcemia and excessive levels can induce cardiac arrest. Drugs known as calcium channel blockers slow HR by binding to these channels and blocking or slowing the inward movement of calcium ions. Caffeine and nicotine are both stimulants of the nervous system and of the cardiac centres causing an increased heart rate. Caffeine works by increasing the rates of depolarization at the SA node, whereas nicotine stimulates the activity of the sympathetic neurons that deliver impulses to the heart. Both stimulants are legal and unregulated, and are known to be very addictive. Both surprise and stress induce physiological response: elevate heart rate substantially. In a study conducted on 8 female and male student actors ages 18 to 25, their reaction to an unforeseen occurrence (the cause of stress) during a performance was observed in terms of heart rate. In the data collected, there was a noticeable trend between the location of actors (onstage and offstage) and their elevation in heart rate in response to stress; the actors present offstage reacted to the stressor immediately, demonstrated by their immediate elevation in heart the minute the unexpected event occurred, but the actors present onstage at the time of the stressor reacted in the following 5 minute period (demonstrated by their increasingly elevated heart rate). This trend regarding stress and heart rate is supported by previous studies; negative emotion/stimulus has a prolonged effect on heart rate in individuals who are directly impacted. In regard to the characters present onstage, a reduced startle response has been associated with a passive defense, and the diminished initial heart rate response has been predicted to have a greater tendency to dissociation. Further, note that heart rate is an accurate measure of stress and the startle response which can be easily observed to determine the effects of certain stressors. Heart rate (HR) (top trace) and tidal volume (Vt) (lung volume, second trace) plotted on the same chart, showing how heart rate increases with inspiration and decreases with expiration. Heart rate is not a stable value and it increases or decreases in response to the body's need in a way to maintain an equilibrium (basal metabolic rate) between requirement and delivery of oxygen and nutrients. The normal SA node firing rate is affected by autonomic nervous system activity: sympathetic stimulation increases and parasympathetic stimulation decreases the firing rate. A number of different metrics are used to describe heart rate. The basal or resting heart rate (HRrest) is defined as the heart rate when a person is awake, in a neutrally temperate environment, and has not been subject to any recent exertion or stimulation, such as stress or surprise. A large body of evidence indicates that the normal range is 60-100 beats per minute. This resting heart rate is often correlated with mortality. For example, all-cause mortality is increased by 1.22 (hazard ratio) when heart rate exceeds 90 beats per minute. The mortality rate of patients with myocardial infarction increased from 15% to 41% if their admission heart rate was greater than 90 beats per minute. ECG of 46,129 individuals with low risk for cardiovascular disease revealed that 96% had resting heart rates ranging from 48-98 beats per minute. Finally, expert consensus reveals that 98% of cardiologists believe that the "60 to 100" range is too high, with a vast majority of them agreeing that 50 to 90 beats per minute is more appropriate. The normal resting heart rate is based on the at-rest firing rate of the heart's sinoatrial node, where the faster pacemaker cells driving the self-generated rhythmic firing and responsible for the heart's autorhythmicity are located. For endurance athletes at the elite level, it is not unusual to have a resting heart rate between 33 and 50 bpm. The maximum heart rate (HRmax) is the highest heart rate an individual can achieve without severe problems through exercise stress,[unreliable medical source?] and generally decreases with age. Since HRmax varies by individual, the most accurate way of measuring any single person's HRmax is via a cardiac stress test. In this test, a person is subjected to controlled physiologic stress (generally by treadmill) while being monitored by an ECG. The intensity of exercise is periodically increased until certain changes in heart function are detected on the ECG monitor, at which point the subject is directed to stop. Typical duration of the test ranges ten to twenty minutes. Adults who are beginning a new exercise regimen are often advised to perform this test only in the presence of medical staff due to risks associated with high heart rates. For general purposes, a formula is often employed to estimate a person's maximum heart rate. However, these predictive formulas have been criticized as inaccurate because they generalized population-averages and usually focus on a person's age. It is well-established that there is a "poor relationship between maximal heart rate and age" and large standard deviations relative to predicted heart rates. (see Limitations of Estimation Formulas). This relationship was found to hold substantially regardless of gender, physical activity status, maximal oxygen uptake, smoking, or body mass index. However, a standard error of the estimate of 10.8 beats/min must be accounted for when applying the formula to clinical settings, and the researchers concluded that actual measurement via a maximal test may be preferable whenever possible. Figures are generally considered averages, and depend greatly on individual physiology and fitness. For example, an endurance runner's rates will typically be lower due to the increased size of the heart required to support the exercise, while a sprinter's rates will be higher due to the improved response time and short duration. While each may have predicted heart rates of 180 (= 220 − age), these two people could have actual HRmax 20 beats apart (e.g., 170–190). Heart rate reserve (HRreserve) is the difference between a person's measured or predicted maximum heart rate and resting heart rate. Some methods of measurement of exercise intensity measure percentage of heart rate reserve. Additionally, as a person increases their cardiovascular fitness, their HRrest will drop, and the heart rate reserve will increase. Percentage of HRreserve is equivalent to percentage of VO2 reserve. The heartbeat of a human embryo begins at approximately 21 days after conception, or five weeks after the last normal menstrual period (LMP), which is the date normally used to date pregnancy in the medical community. The electrical depolarizations that trigger cardiac myocytes to contract arise spontaneously within the myocyte itself. 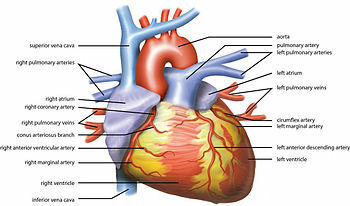 The heartbeat is initiated in the pacemaker regions and spreads to the rest of the heart through a conduction pathway. Pacemaker cells develop in the primitive atrium and the sinus venosus to form the sinoatrial node and the atrioventricular node respectively. Conductive cells develop the bundle of His and carry the depolarization into the lower heart. The human heart begins beating at a rate near the mother’s, about 75–80 beats per minute (bpm). 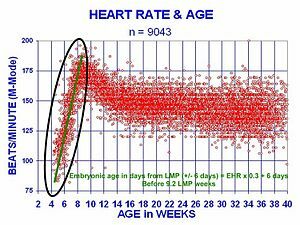 The embryonic heart rate then accelerates linearly for the first month of beating, peaking at 165–185 bpm during the early 7th week, (early 9th week after the LMP). This acceleration is approximately 3.3 bpm per day, or about 10 bpm every three days, an increase of 100 bpm in the first month. Trained athletes tend to have slow resting heart rates, and resting bradycardia in athletes should not be considered abnormal if the individual has no symptoms associated with it. For example, Miguel Indurain, a Spanish cyclist and five time Tour de France winner, had a resting heart rate of 28 beats per minute, one of the lowest ever recorded in a healthy human. Daniel Green achieved the world record for the slowest heartbeat in a healthy human with a heart rate of just 26 bpm in 2014. An Australian-led international study of patients with cardiovascular disease has shown that heart beat rate is a key indicator for the risk of heart attack. The study, published in The Lancet (September 2008) studied 11,000 people, across 33 countries, who were being treated for heart problems. Those patients whose heart rate was above 70 beats per minute had significantly higher incidence of heart attacks, hospital admissions and the need for surgery. Higher heart rate is thought to be correlated with an increase in heart attack and about a 46 percent increase in hospitalizations for non-fatal or fatal heart attack. Other studies have shown that a high resting heart rate is associated with an increase in cardiovascular and all-cause mortality in the general population and in patients with chronic disease. A faster resting heart rate is associated with shorter life expectancy and is considered a strong risk factor for heart disease and heart failure, independent of level of physical fitness. Specifically, a resting heart rate above 65 beats per minute has been shown to have a strong independent effect on premature mortality; every 10 beats per minute increase in resting heart rate has been shown to be associated with a 10–20% increase in risk of death. In one study, men with no evidence of heart disease and a resting heart rate of more than 90 beats per minute had a five times higher risk of sudden cardiac death. Similarly, another study found that men with resting heart rates of over 90 beats per minute had an almost two-fold increase in risk for cardiovascular disease mortality; in women it was associated with a three-fold increase. Given these data, heart rate should be considered in the assessment of cardiovascular risk, even in apparently healthy individuals. Heart rate has many advantages as a clinical parameter: It is inexpensive and quick to measure and is easily understandable. Although the accepted limits of heart rate are between 60 and 100 beats per minute, this was based for convenience on the scale of the squares on electrocardiogram paper; a better definition of normal sinus heart rate may be between 50 and 90 beats per minute. Lifestyle and pharmacological regimens may be beneficial to those with high resting heart rates. Exercise is one possible measure to take when an individual's heart rate is higher than 80 beats per minute. Diet has also been found to be beneficial in lowering resting heart rate: In studies of resting heart rate and risk of death and cardiac complications on patients with type 2 diabetes, legumes were found to lower resting heart rate. This is thought to occur because in addition to the direct beneficial effects of legumes, they also displace animal proteins in the diet, which are higher in saturated fat and cholesterol. ^ a b "All About Heart Rate (Pulse)". All About Heart Rate (Pulse). American Heart Association. 22 Aug 2017. Retrieved 25 Jan 2018. ^ a b c Fuster, Wayne & O'Rouke 2001, pp. 78–79. ^ a b c Aladin, Amer I.; Whelton, Seamus P.; Al-Mallah, Mouaz H.; Blaha, Michael J.; Keteyian, Steven J.; Juraschek, Stephen P.; Rubin, Jonathan; Brawner, Clinton A.; Michos, Erin D. (2014-12-01). "Relation of resting heart rate to risk for all-cause mortality by gender after considering exercise capacity (the Henry Ford exercise testing project)". The American Journal of Cardiology. 114 (11): 1701–06. doi:10.1016/j.amjcard.2014.08.042. ISSN 1879-1913. PMID 25439450. ^ a b c Hjalmarson, A.; Gilpin, E. A.; Kjekshus, J.; Schieman, G.; Nicod, P.; Henning, H.; Ross, J. (1990-03-01). "Influence of heart rate on mortality after acute myocardial infarction". The American Journal of Cardiology. 65 (9): 547–53. doi:10.1016/0002-9149(90)91029-6. ISSN 0002-9149. PMID 1968702. ^ a b c Mason, Jay W.; Ramseth, Douglas J.; Chanter, Dennis O.; Moon, Thomas E.; Goodman, Daniel B.; Mendzelevski, Boaz (2007-07-01). "Electrocardiographic reference ranges derived from 79,743 ambulatory subjects". Journal of Electrocardiology. 40 (3): 228–34. doi:10.1016/j.jelectrocard.2006.09.003. ISSN 1532-8430. PMID 17276451. ^ a b c Spodick, D. H. (1993-08-15). "Survey of selected cardiologists for an operational definition of normal sinus heart rate". The American Journal of Cardiology. 72 (5): 487–88. doi:10.1016/0002-9149(93)91153-9. ISSN 0002-9149. PMID 8352202. ^ Anderson JM (1991). "Rehabilitating elderly cardiac patients". West. J. Med. 154 (5): 573–78. PMC 1002834. PMID 1866953. ^ a b c d e f g h i j k l m n o p q r s t u v w Betts, J. Gordon (2013). Anatomy & physiology. pp. 787–846. ISBN 978-1938168130. Retrieved 11 August 2014. ^ Mustonen, Veera; Pantzar, Mika (2013). "Tracking social rhythms of the heart". Approaching Religion. 3 (2): 16–21. ^ Brosschot, J.F. ; Thayer, J.F. (2003). "Heart rate response is longer after negative emotions than after positive emotions". International Journal of Psychophysiology. 50 (3): 181–87. doi:10.1016/s0167-8760(03)00146-6. ^ Chou, C.Y. ; Marca, R.L. ; Steptoe, A.; Brewin, C.R. (2014). "Heart rate, startle response, and intrusive trauma memories". Psychophysiology. 51 (3): 236–46. doi:10.1111/psyp.12176. PMC 4283725. PMID 24397333. ^ Sherwood, L. (2008). Human Physiology, From Cells to Systems. p. 327. ISBN 9780495391845. Retrieved 2013-03-10. ^ Berne, Robert; Levy, Matthew; Koeppen, Bruce; Stanton, Bruce (2004). Physiology. Elsevier Mosby. p. 276. ISBN 978-0-8243-0348-8. ^ Atwal S, Porter J, MacDonald P (February 2002). "Cardiovascular effects of strenuous exercise in adult recreational hockey: the Hockey Heart Study". CMAJ. 166 (3): 303–07. PMC 99308. PMID 11868637. ^ Froelicher, Victor; Myers, Jonathan (2006). Exercise and the Heart (fifth ed.). Philadelphia: Elsevier. pp. ix, 108–12. ISBN 978-1-4160-0311-3. ^ Nes, B.M. ; Janszky, I.; Wisloff, U.; Stoylen, A.; Karlsen, T. (December 2013). 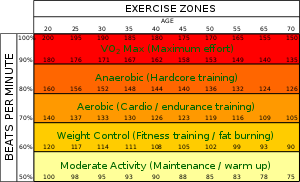 "Age‐predicted maximal heart rate in healthy subjects: The HUNT Fitness Study". Scandinavian Journal of Medicine & Science in Sports. 23 (6): 697–704. doi:10.1111/j.1600-0838.2012.01445.x. PMID 22376273. ^ a b Tanaka H, Monahan KD, Seals DR (January 2001). "Age-predicted maximal heart rate revisited". J. Am. Coll. Cardiol. 37 (1): 153–56. doi:10.1016/S0735-1097(00)01054-8. PMID 11153730. ^ Gellish RL, Goslin BR, Olson RE, McDonald A, Russi GD, Moudgil VK (2007). "Longitudinal modeling of the relationship between age and maximal heart rate". Med Sci Sports Exerc. 39 (5): 822–29. doi:10.1097/mss.0b013e31803349c6. PMID 17468581. ^ a b c d e f g h Kolata, Gina (2001-04-24). "'Maximum' Heart Rate Theory Is Challenged". New York Times. ^ a b c Robergs R, Landwehr R (2002). "The Surprising History of the 'HRmax=220-age' Equation" (PDF). Journal of Exercise Physiology. 5 (2): 1–10. ^ Inbar, O. Oten, A., Scheinowitz, M., Rotstein, A., Dlin, R. and Casaburi, R. "Normal cardiopulmonary responses during incremental exercise in 20-70-yr-old men." Med Sci Sport Exerc 1994;26(5):538-546. ^ Gulati M, Shaw LJ, Thisted RA, Black HR, Bairey Merz CN, Arnsdorf MF (2010). "Heart rate response to exercise stress testing in asymptomatic women: the st. James women take heart project". Circulation. 122 (2): 130–37. doi:10.1161/CIRCULATIONAHA.110.939249. PMID 20585008. ^ Wohlfart B, Farazdaghi GR (May 2003). "Reference values for the physical work capacity on a bicycle ergometer for men -- a comparison with a previous study on women". Clin Physiol Funct Imaging. 23 (3): 166–70. doi:10.1046/j.1475-097X.2003.00491.x. PMID 12752560. ^ Farazdaghi GR, Wohlfart B (November 2001). "Reference values for the physical work capacity on a bicycle ergometer for women between 20 and 80 years of age". Clin Physiol. 21 (6): 682–87. doi:10.1046/j.1365-2281.2001.00373.x. PMID 11722475. ^ Lounana J, Campion F, Noakes TD, Medelli J (2007). "Relationship between %HRmax, %HR reserve, %VO2max, and %VO2 reserve in elite cyclists". Med Sci Sports Exerc. 39 (2): 350–57. doi:10.1249/01.mss.0000246996.63976.5f. PMID 17277600. ^ Karvonen MJ, Kentala E, Mustala O (1957). "The effects of training on heart rate; a longitudinal study". Ann Med Exp Biol Fenn. 35 (3): 307–15. PMID 13470504. ^ Swain DP, Leutholtz BC, King ME, Haas LA, Branch JD (1998). "Relationship between % heart rate reserve and % VO2 reserve in treadmill exercise". Med Sci Sports Exerc. 30 (2): 318–21. doi:10.1097/00005768-199802000-00022. PMID 9502363. ^ Karvonen J, Vuorimaa T (May 1988). "Heart rate and exercise intensity during sports activities. Practical application". Sports Medicine. 5 (5): 303–11. doi:10.2165/00007256-198805050-00002. PMID 3387734. ^ a b Cole CR, Blackstone EH, Pashkow FJ, Snader CE, Lauer MS (1999). "Heart-rate recovery immediately after exercise as a predictor of mortality". N. Engl. J. Med. 341 (18): 1351–57. doi:10.1056/NEJM199910283411804. PMID 10536127. ^ a b c d e Froelicher, Victor; Myers, Jonathan (2006). Exercise and the Heart (fifth ed.). Philadelphia: Elsevier. p. 114. ISBN 978-1-4160-0311-3. ^ Fuster, Wayne & O'Rouke 2001, pp. 824–29. ^ Salerno DM, Zanetti J (1991). "Seismocardiography for monitoring changes in left ventricular function during ischemia". Chest. 100 (4): 991–93. doi:10.1378/chest.100.4.991. ^ Guinness World Records 2004 (Bantam ed.). New York: Bantam Books. 2004. pp. 10–11. ISBN 978-0-553-58712-8. ^ "Slowest heart rate: Daniel Green breaks Guinness World Records record". World Record Academy. 29 November 2014. ^ Zhang GQ, Zhang W (2009). "Heart rate, lifespan, and mortality risk". Ageing Res. Rev. 8 (1): 52–60. doi:10.1016/j.arr.2008.10.001. PMID 19022405. ^ Fox K, Ford I (2008). "Heart rate as a prognostic risk factor in patients with coronary artery disease and left-ventricular systolic dysfunction (BEAUTIFUL): a subgroup analysis of a randomised controlled trial". Lancet. 372 (6): 817–21. doi:10.1016/S0140-6736(08)61171-X. PMID 18757091. ^ Cook, Stéphane; Hess, Otto M. (2010-03-01). "Resting heart rate and cardiovascular events: time for a new crusade?". European Heart Journal. 31 (5): 517–19. doi:10.1093/eurheartj/ehp484. ISSN 1522-9645. PMID 19933283. ^ a b Cooney, Marie Therese; Vartiainen, Erkki; Laatikainen, Tiina; Laakitainen, Tinna; Juolevi, Anne; Dudina, Alexandra; Graham, Ian M. (2010-04-01). "Elevated resting heart rate is an independent risk factor for cardiovascular disease in healthy men and women". American Heart Journal. 159 (4): 612–19.e3. doi:10.1016/j.ahj.2009.12.029. ISSN 1097-6744. PMID 20362720. ^ a b Teodorescu, Carmen; Reinier, Kyndaron; Uy-Evanado, Audrey; Gunson, Karen; Jui, Jonathan; Chugh, Sumeet S. (2013-08-01). "Resting heart rate and risk of sudden cardiac death in the general population: influence of left ventricular systolic dysfunction and heart rate-modulating drugs". Heart Rhythm: The Official Journal of the Heart Rhythm Society. 10 (8): 1153–58. doi:10.1016/j.hrthm.2013.05.009. ISSN 1556-3871. PMC 3765077. PMID 23680897. ^ Jensen, Magnus Thorsten; Suadicani, Poul; Hein, Hans Ole; Gyntelberg, Finn (2013-06-01). "Elevated resting heart rate, physical fitness and all-cause mortality: a 16-year follow-up in the Copenhagen Male Study". Heart. 99 (12): 882–87. doi:10.1136/heartjnl-2012-303375. ISSN 1468-201X. PMC 3664385. PMID 23595657. ^ a b Woodward, Mark; Webster, Ruth; Murakami, Yoshitaka; Barzi, Federica; Lam, Tai-Hing; Fang, Xianghua; Suh, Il; Batty, G. David; Huxley, Rachel (2014-06-01). "The association between resting heart rate, cardiovascular disease and mortality: evidence from 112,680 men and women in 12 cohorts". European Journal of Preventive Cardiology. 21 (6): 719–26. doi:10.1177/2047487312452501. ISSN 2047-4881. PMID 22718796. ^ Arnold, J. Malcolm; Fitchett, David H.; Howlett, Jonathan G.; Lonn, Eva M.; Tardif, Jean-Claude (2008-05-01). "Resting heart rate: a modifiable prognostic indicator of cardiovascular risk and outcomes?". The Canadian Journal of Cardiology. 24 Suppl A: 3A–8A. doi:10.1016/s0828-282x(08)71019-5. ISSN 1916-7075. PMC 2787005. PMID 18437251. ^ a b Nauman, Javaid (2012-06-12). "Why measure resting heart rate?". Tidsskrift for den Norske Lægeforening: Tidsskrift for Praktisk Medicin, Ny Række. 132 (11): 1314. doi:10.4045/tidsskr.12.0553. ISSN 0807-7096. PMID 22717845. ^ Spodick, DH (1992). "Operational definition of normal sinus heart rate". Am J Cardiol. 69 (14): 1245–46. doi:10.1016/0002-9149(92)90947-W.
^ Sloan, Richard P.; Shapiro, Peter A.; DeMeersman, Ronald E.; Bagiella, Emilia; Brondolo, Elizabeth N.; McKinley, Paula S.; Slavov, Iordan; Fang, Yixin; Myers, Michael M. (2009-05-01). "The effect of aerobic training and cardiac autonomic regulation in young adults". American Journal of Public Health. 99 (5): 921–28. doi:10.2105/AJPH.2007.133165. ISSN 1541-0048. PMC 2667843. PMID 19299682. ^ a b Jenkins, David J. A.; Kendall, Cyril W. C.; Augustin, Livia S. A.; Mitchell, Sandra; Sahye-Pudaruth, Sandhya; Blanco Mejia, Sonia; Chiavaroli, Laura; Mirrahimi, Arash; Ireland, Christopher (2012-11-26). "Effect of legumes as part of a low glycemic index diet on glycemic control and cardiovascular risk factors in type 2 diabetes mellitus: a randomized controlled trial". Archives of Internal Medicine. 172 (21): 1653–60. doi:10.1001/2013.jamainternmed.70. ISSN 1538-3679. PMID 23089999. ^ "Atrioventricular Block: Practice Essentials, Background, Pathophysiology". Medscape Reference. 2 July 2018. Fuster, Valentin; Wayne, Alexander R.; O'Rouke, Robert A. (2001). Hurst's The Heart (10th International ed.). New York: McGraw-Hill. ISBN 978-0071162968. OCLC 49034333. Jarvis, C. (2011). Physical Examination and Health Assessment (6 ed.). Saunders Elsevier. ISBN 978-1437701517.